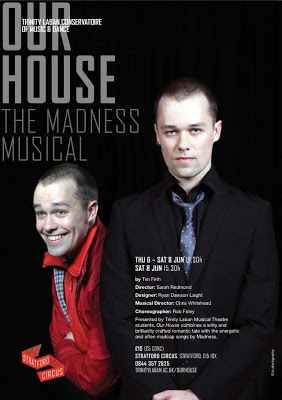 Our House, the juke box musical based upon the Madness catalogue is given a sparkling re-visit by the second year Musical Theatre students of Trinity Laban. Set in and around London's Camden Town, the story follows Joe Casey a likeable cheeky chancer of a lad, who is caught breaking into a house with his girlfriend. As the police arrive, Joe's character splits into two: spiv Joe who chances it and runs away, contrasted with honest Joe who is arrested, serves a stretch in a Young Offenders institution and who then battles against disapproval and stigma as he tries to do "the right things" in his lfe. It's a classic morality tale of wrong versus right set against a backdrop of strong north London family values, lifelong friendships and corrupt multi-million pound property deals. Sion Warner effortlessly masters both the humble and the arrogant personae of Joe in a quality performance enhanced with split second costume changes that wow with technically timed perfection. Warner has a hint of Madness' lead singer Suggs in his portrayal and his singing of the two classics I Go Driving In My Car and It Must Be Love are neat tributes to both numbers. Joe may be the lead character but it is the company around him that create his world and the lively London that Redmond sculpts from her cast is impressive. Lewis Asquith as the spirit of Joe's dead father, accompanying him on stage through much of the show, is a masterfully understated performance of a fallible but big hearted man who despite his blunders, always loved his family. 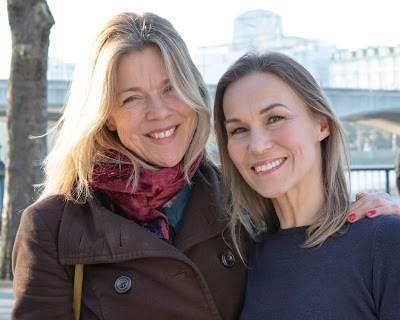 Cathy Thomas who plays his widow is heartrendingly believable as she plays a 40-something mum twice the actress' age. As Sarah, Joe's love, Lucy Thomas is a perfectly voiced and well acted foil to both versions of our (anti) hero and Thomas rises well to the challenge of having to play Sarah from two different perspectives. The tightly observed comedy comes from a quartet of friends whose timing and delivery is a treat of wit and smutty innuendo. Nazerene Williams, who performs an eye-watering splits and Amy Depledge are the giggling girls, whilst Joe's half-brothers, played by Alex Gilchrist and David Grant are a cracking pair of comically awkward adolescents. The bad guys of the piece are smoothly crafted turns from Tom Self as Reecey, who grows up from school bully to hired thug (via a sharp cameo as a Las Vegas Elvis impersonator) and Mark Gollop as ruthless developer Pressman, a pantomime villain for our time. The choreography is inspired work from Robert Foley. The ensemble numbers of Baggy Trousers, Embarrassment (with a brilliant boxing-ring interpretation from Redmond) and The Sun And The Rain are moving and exhilarating in their audacity, with credit too to Dance Captain Anna Britton and her lead of the troupe in executing Foley's visions. A nod also to the Finale, which is a feast of fancy footwork brilliantly executed by the entire company. Chris Whitehead's band, drawn mainly from 1st and 2nd year music students provides an accomplished accompaniment. At its core, wind player Victoria Bell's saxophone work provides the most ballsy authentic Madness sound that truly takes an already wonderful show, one step beyond. Sarah Redmond crafts a cracking musical. Her stage is bare, save for a handful of boxes and some bunting, with video projection setting scenic suggestions. Her mission is clear: this vision of London will be created entirely by performance and it's a mission that succeeds. The production reflects a very talented bunch of students that have been led by an inspirational creative team. This show deserves a wider audience and Trinity Laban's next production is eagerly awaited.